Hatikvah. It's arguably the most recognized Jewish melody, even more than Hava Nagila. OK, we'll admit we're on a Hatikvah kick. Yesterday we posted a video of Hatikvah being played on a shofar. We plan to post other versions, some traditional and some unusual, in the weeks and months to come. But where did this song, that causes Jews everywhere to stand up and sing, come from? 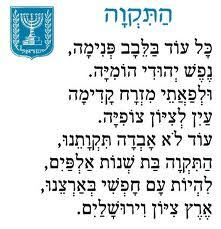 The lyrics, the last verse of which was modified with the creation of the State of Israel, are well known as the work of Naftali Herz Imber, who wrote a nine-verse poem in Romania in 1877. A few years later, Imber moved to Jerusalem, where the poem, Tikvatenu, was published in 1886. And the melody? Although widely believed to have been composed by Samuel Cohen in 1888, Cohen himself recalled many years later that he had adapted the melody from a Romanian folk song. This folk song was itself adapted from an Italian madrigal called La Mantovana, written in 1600, which shares many structural elements with Hatikva. This melody originated as an Italian madrigal around the year 1600 written by Giuseppino del Biado with the text "Fuggi, fuggi, fuggi dal questo cielo." In 1874, Czech composer Bedrich Smetana wrote a symphonic poem called The Moldau, also based on La Mantovana as a tribute to his homeland. Cohen may have also been influenced by Smetana's beautiful melody. Here are two videos to illustrate these origins of Hatikva. First, the Italian madrigal, played by Owain Phyfe, a performer at Renaissance Fairs around the U.S., followed by a performance of the first part of Smetana's symphonic poem The Moldau by Arie Vardi conducting the Israel Philharmonic Orchestra. Enjoy!